Besides our extensive science fiction library (being cataloged by a brave young intern even as we speak), our lesson plans, our workshops, our online classes, and our essays, we have a YouTube page! The page has several speeches and interviews from luminaries such as China Mievile, Isaac Asimov, Frederick Pohl, Damon Knight and Forrest Ackerman, as well as highlights from the 2004 Campbell Conference. The AboutSF and Center for the Study of Science Fiction sites have all kinds of treasures hidden away, just waiting to be unearthed. This week, I want to point out the wealth of essays written by Jim Gunn, Chris McKitterick, and others. Welcome to Isaac Bell, the new AboutSF coordinator! I’m thrilled to introduce Isaac Bell as the new volunteer coordinator for AboutSF. Isaac is a first-year Master’s student in the Composition and Rhetoric track in the department of English at the University of Kansas. He is an alumnus of both the 2011 Science Fiction Writers Workshop and the Intensive English Institute on the Teaching of Science Fiction provided by the Center for the Study of Science Fiction (www.sfcenter.ku.edu). 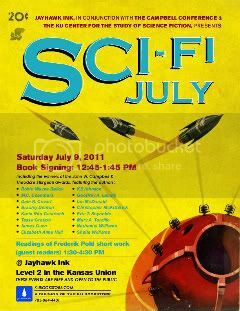 The theme for the 2011 Campbell Conference held this past July in Lawrence, KS was "Alternating Currents: Frederik Pohl and Theodore Sturgeon." The df/h ezine SILVER BLADE (wwww.silverblade.net ) is seeking slush pile readers. Those of you who want to explore the relationship between the needs of the art of writing and the way it interacts with the needs of editing and putting out a magazine should consider contacting SILVER BLADE. in fact whenever a zine is looking for slush pile readers volunteer. It is going to make you a bettter scholar and writer of sf/f/h poetry.